2. The total number of BNP candidates has slumped. In 2010 it was 388. This year it is eight. That’s a remarkable drop and much larger than I’d been expecting. The number of English Democrat candidates has also fallen, from 104 to 32. It seems the far-right will not be quite such an obvious presence at the election this time. 3. 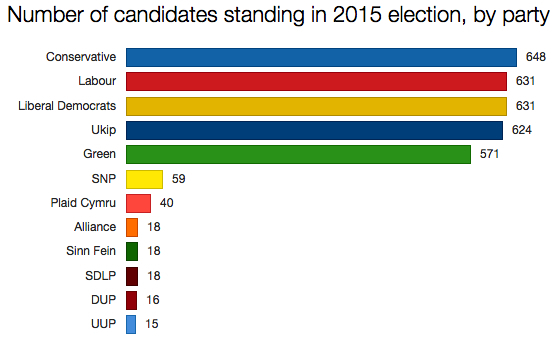 The Conservatives are fielding the most number of candidates across the whole of the UK. This is because unlike Labour and the Lib Dems they’ve decided to stand in 16 of the 18 seats in Northern Ireland – something about which I’m not sure the Ulster Unionists and DUP will be particularly thrilled. The two they’ve decided to miss are Femanagh & South Tyrone and Belfast North. 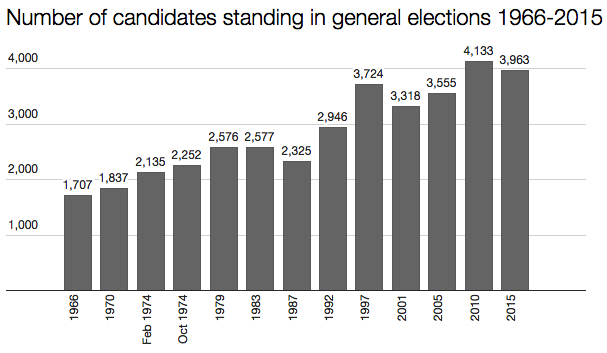 Meanwhile Ukip is fielding a total of 624 candidates, up on 558 in 2010. There are 650 seats in the UK, which means there must be 26 seats which for whatever reason the party has decided not to bother with. 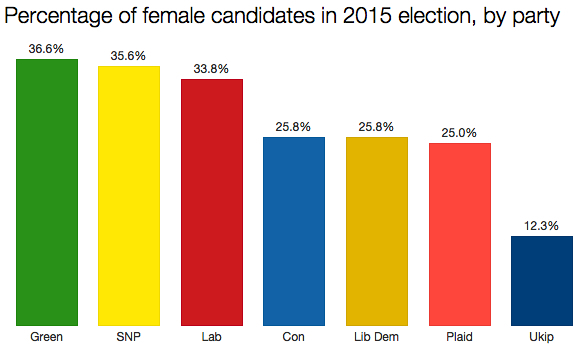 The number of female candidates is 1,020, up from 854 in 2010. That’s 26% of the total. In 2010 it was 21%; in 2005 20%. 4. A total of 72 parties are fielding just one candidate. There are a further 145 candidates standing under the catch-all name Independent. There are 19 parties are fielding two candidates, six parties fielding three and 10 fielding four. In all, 140 different parties are fighting the election. 5. The Pirate Party has six candidates, two more than the Communists. The Monster Raving Loony Party has 15, the same as the Ulster Unionists. One of the biggest single-issue parties is Cannabis is Safer Than Alcohol (31 seats). Three of the smallest are Hoi Polloi (one), Nothing Borrowed Nothing Old Something New (one), and Al-Zebabist Nation of Ooog (one candidate, in the increasingly crowded field of Thanet South). UKIP are standing in several NI constituencies just like the Conservatives. So 624 out of 650 for UKIP in fact. This has also now been corrected! The far right not such a obvious presence? We all know where they have gone (as occasional expulsions from a certain party indicate) (and it is not the Greens).